Below is a list of questions commonly asked by our customers. If you cannot find the answers that you are looking for on this page, please contact Large Animal Practice. What is Equine Dentistry and how is it different from floating a horse? Equine Dentistry has been commonly referred to as “floating” a horses teeth for hundreds of years because it was thought that the teeth should be leveled and smoothed to have the most efficient chewing surface. “Floating” was the method of smoothing and leveling performed by ancient masons. 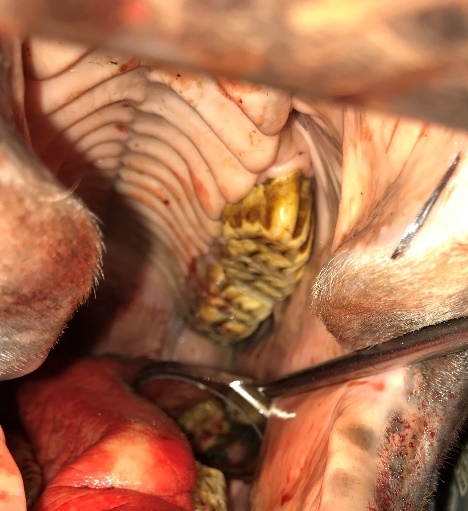 The profession of equine dental veterinarians is now using the term occlusal adjustment or dental equilibration to describe the process of removing sharp enamel points and correcting malocclusions in your horse’s mouth. 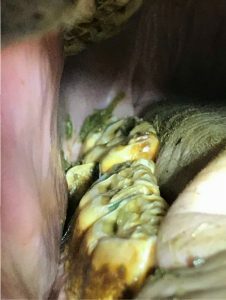 It is important to note that horses teeth should NOT be leveled because this will inhibit the normal side to side chewing process that is necessary to process feed. Why do my horses’ teeth need to be floated? Horses evolved to have long hypsodont type teeth that are constantly erupting (They don’t “grow” throughout their lives! They’re just born with it!) into the oral cavity throughout their lives. This is in contrast to humans with brachydont teeth, what you’ve got in your mouth is what you will always have once your permanent teeth are present! Horses evolved this way to enable them to eat rough, abrasive feed without wearing through the surface of a brachydont tooth. 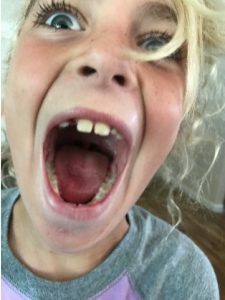 As a consequence of constant eruption and side to side grinding of feeding, they gradually grind away the chewing surface of their teeth resulting in sharp enamel points which need to be floated or reduced as part of routing dental maintenance. Some horses may develop dental imbalances or malocclusions that impair normal chewing function, comfort and oral health. This is the most common question that we are asked regarding equine dentistry. The Drs. at Large Animal Practice consider the age and function of each patient when creating a dental plan as we feel that every horse wears their teeth in a different manner and speed. For regular clients we generally do a brief unsedated exam every time we vaccinate your horse. It is important to note that an unsedated exam is NOT a replacement for a sedated speculum examination where EVERY tooth can be inspected. Young horses mouths change rapidly with the loss of baby teeth and replacement with adult teeth between the ages of 3-5 years. It is often found that wave malocclusions seem to form shortly after the horse has a “full” mouth. In adult animals these malocclusions tend to be “permanent” and aggressive correction can be dangerous and contraindicated. Calculated, careful adjustment can be performed to make the mouth functional and comfortable, however it should be noted that these malocclusions return in 12 months. Horses with severe malocclusions or loss of teeth may require examination and treatment every 6 months. Horses with a healthy mouth may only need floating yearly or every few years. Yes we do hand float horses. We still hand float horses because we feel that it does help some horses with mild dental issues that wouldn’t have the option of a more expensive procedure. It should be noted once again that exams without a speculum and a bright light are not a replacement for a full examination and floating with superior visibility and precision. With the development of safer and more precise power dental instrumentation, we feel that we can do a more thorough and efficient job. The dental instruments that we utilize are designed to smooth the surface of the tooth without causing trauma to the soft tissues of the mouth. What are the signs of equine dental problems? Dropping or quidding of hay while eating. Being slow to finish their normal meal. Unprocessed feed in their manure. Weight loss or difficulty maintaining weight. Turning, lifting or thrusting into feed while eating. Fighting or chewing the bit. Bucking, rearing, pawing or other behavioral issues. Refusing hard feed that they previously enjoyed. 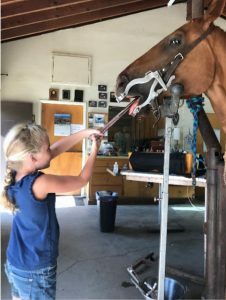 Do you specialize in Equine Dentistry? The American Veterinary Dental College board certifies veterinarians who go through a rigorous training regimen in order to specialize in dentistry. Currently, worldwide there are 19 active Equine Dental Specialists. 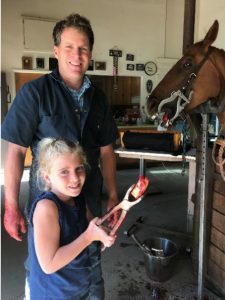 The veterinarians at Large Animal Practice enjoy and are passionate about equine dentistry, however ethically and legally no one is able to say they “specialize in equine dentistry” EXCEPT a board certified dentist. They have put in the years of dedicated higher education and deserve to have the distinction of being a Specialist. There are numerous 3-4 week short courses to become a “certified equine dentist”, however these certificates are not recognized by any governing body and do not replace the years of training that veterinarians receive and continue to receive in education throughout their career. A lay dentist does not have a license or liability insurance in case malpractice occurs and they also do not have legal access or expertise in medications and sedation necessary for the procedures they perform.